When you need to cut through concrete, one possible solution is to attempt concrete wire sawing. There are many different ways to approach the task of concrete work. When you need to cut through concrete, one possible solution is to attempt concrete wire sawing. However, your workers may not know how to prepare this process, and you may not even understand it yourself. Luckily, here you will find a guide to the basics of concrete wire sawing. 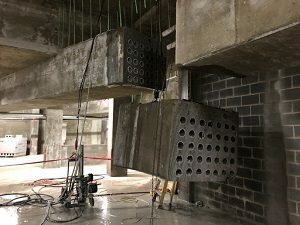 One of the most important attributes of concrete wire sawing is how clean it is – it doesn’t leave an enormous amount of mess behind it, and it won’t damage anything around the concrete that you don’t intend to cut. Before you begin your next concrete cutting project, decide whether this method is the right one for the job. You can also comply with local laws, guidelines, and regulations when it comes to sawing or cutting through concrete. Sometimes, conventional saws will overheat while attempt to make the incisions you need, but the wires will not encounter this same issue. Do you need to complete some work near the waterfront or around any structures that are close to a body of water, whether natural or artificial? Then concrete wire sawing could be the solution you need without damage the surrounding structures. Lastly, you should consider the advantages of using this method to cut through concrete. For instance, this technique is much quieter than its alternatives. The project you are assigned to could be more complicated and take longer than you originally expected it to – even if that’s the case, put your trust to have G&M Services get the job for you on time and under budget! This entry was posted on Friday, January 25th, 2019	at 9:53 am	. Both comments and pings are currently closed.